Are you going to dance around a maypole today??? I remember we used to do that when I was little! I was inspired by the pretty pinks and roses! I created my card by first making the background. I stamped the wreaths from last month's release- Hello Spring and the roses from the older Paper Sweeties Release - Pretty Posies, with Versamark ink onto some Tim Holtz watercolor paper. I sprinkled the inked images with white embossing powder and heated it with my heat gun. Next I watercolored the images and background with Spun Sugar, Picked Raspberry and Worn Lipstick Distress inks and water. I wrapped a piece of green twine around the panel and tied a bow. 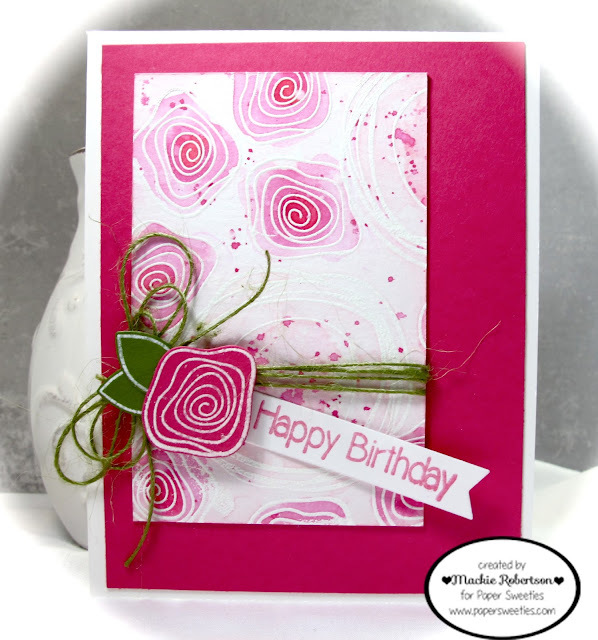 Next I die cut a posie with the matching Pretty Posies Sweet Cut with some pink card stock. I stamped the image with Versamark ink and heat embossed it with white embossing powder. I did the same thing with the leaves. The sentiment is from one of my FAVORITE Paper Sweeties stamp sets called Hello Friend! I hope I have inspired you to join us this month! We sure do enjoy seeing your fabulous creations! 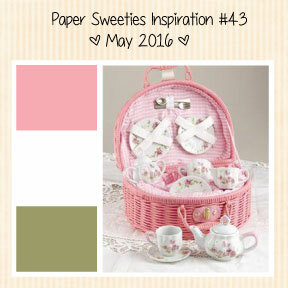 Remember... a random winner to the Paper Sweeties Shoppe is given away each month! 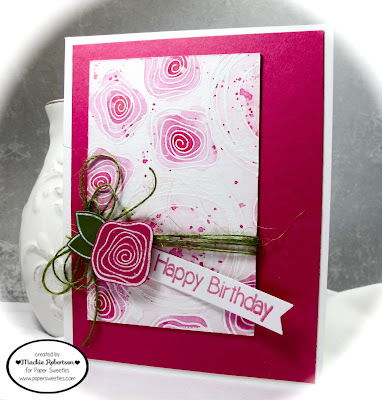 Love this gorgeous card Mackie! Fantastic background panel! So ...yummy! This is so beautiful! Love the background and all of that pink! The watercoloring! Love!! Sooooooooo gorgeous! LOVING those flowers!!!!!!!!!!!!!!!! Beautiful water colored flowers, Mackie!! Your card is so pretty in pink...love it!!! Love this Mackie! Those whimsical blooms and speckles are delightful!! Completely in love with this card!!!! Love your beautiful stamped and watercolored panel, Mackie! A truly gorgeous card! So pretty Mackie! Love the bright pink blossoms! Gorgeous card, Mackie! I love these bright roses--so cheerful!